This 5th floor unit has two bedrooms, two baths and fabulous views of the Gulf of Mexico & beach from the balcony & both bedrooms. It is equipped with everything you need for comfortable living including wireless Internet. The kitchen is fully equipped with refrigerator/ice maker, stove with microwave, dishwasher, toaster, coffee maker, blender, and a full supply of dishes, utensils and cookware. The laundry room is equipped with a washer/dryer, iron and board and vacuum cleaner. The large dining table seats 6 with a bar that seats 2. The 2 bedrooms have queen size beds with a new queen size sofa sleeper in the living area. The living room and both bedrooms have HDTV's. The grounds at Tradewinds are clean and tropical along with the Gulf breeze for a totally relaxing atmosphere. Chair and umbrella rentals are available on the beach and the indoor/outdoor heated pool is beachside. It is located 30 miles between Mobile, AL (visit the USS Alabama Battleship) & Pensacola, FL (visit the Pensacola Naval Museum). In the heart of Orange Beach and 5 miles from Gulf Shores, it is also within blocks of resturants (yummy seafood), grocery stores and shopping. Across the street is Adventure Island & only 3 miles to The Wharf, where you will find a movie theater, restaurants, shopping & an amphitheater for live concerts. Whether you choose to relax at the beach or pool, just hang out & relax in this comfortable family friendly unit or get out and be adventuresome, IT'S ALL HERE! If you've never been, there's no time like the first. If you've wanted to return, there's no time like the present. We would be pleased to have you as our guests. For immediate information please call. PLEASE NOTE >>> PLEASE DO NOT USE THE YELLOW "REQUEST TO BOOK" BUTTON as it will cause you to receive a ton of messages and marketing emails from VRBO. Rather, please use the blue "Send Email" button just below the "Owner" on the right side of our listing to contact me for current availability and rates. When our children were young we enjoyed going to Orange Beach and Tradewinds provides the comfort and ease I looked for. We enjoy this complex for it's location and peacefullness. I was impressed by it's size and layout. Tradewinds is 14 floors and 107 units so it is not overwhelming. It is near an abundance of resturaunts, grocery stores, The Wharf (concerts in the amphitheater), water sport rentals, souvenir shops and Adventure Island is across the street. The beach can been seen from all windows. Linens provided but not beach towels. Regular coffee maker and Keurig provided. You will need to provide your coffee and Kcups. table seats 6. Bar has 2 stools. Our place was very cozy! Other than some young college boys stealing signs,throwing wood into ocean then stealing beach flag from the beach, climbing floors from balcony up to 6 floor. This place needs security cameras. I reported it but nothing was done! The condo was extremely clean and nicely decorated. Gayle was friendly and easy to contact. The condo we rented was great! Everything we could have asked for. The building and facilities need a little updating in the way of cleaning corridors, trimming landscape, and painting/updated swimming pool chairs. The weather was not quite what we were hoping for, but we found inside attractions to visit. Never waited for the elevator more than just a minute or two, and that was a plus. I would suggest renting beach chair setups a day in advance as they are taken quickly. If you want to take a dolphin cruise, call Fun Boats! Informational and entertaining! Make sure you eat breakfast at the Ruby Slipper. It is the best ever, and the waiters and waitresses know their stuff! If you can, rent a property with beach front view. Our condo had a beach view on each side but not directly in front of the balcony. 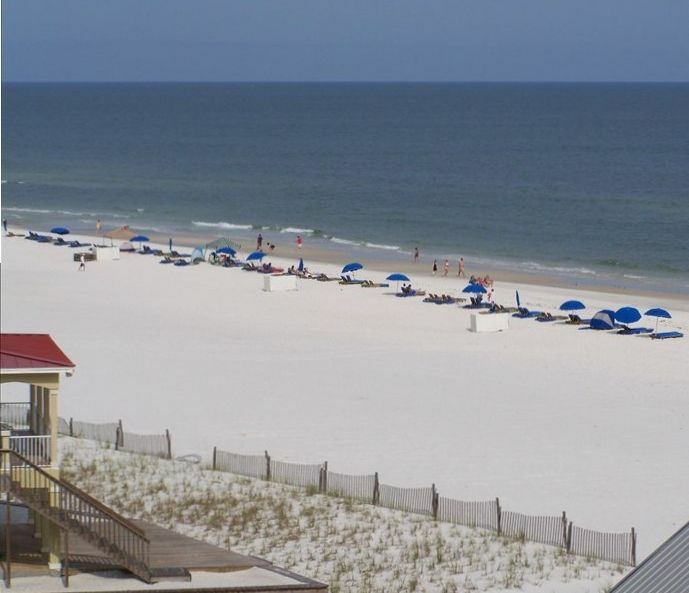 You can never go wrong when you vacation at Orange Beach! AH-MAZING stay for our girls weekend! Gayle is just the best to work with! She's responsive, kind and has a wonderful condo! We love staying year after year! Thank you for helping us make wonderful memories! Condo was decorated beautifully! The view was amazing. And the location was perfect. The owner was very accommodating. We will definitely be back. Located 30 miles between Mobile, AL (visit the USS Alabama Battleship) & Pensacola, FL (visit the Pensacola Naval Museum). In the heart of Orange Beach and 5 miles from Gulf Shores, it is also within blocks of restaurants (yummy seafood), grocery stores and shopping. Across the street is Adventure Island & only 3 miles to The Wharf, where you will find a movie theater, restaurants, shopping & an amphitheater for live concerts. $90 for housekeeping, lodging taxes 13%. Parking passes $20 each. Cash, Checks, money orders, Credit Cards (add 4 %).